Apple's Services earnings aren't being considered strongly enough by investors, one analyst believes, arguing that if the business was properly weighted, the stock company's stock would be at least 10 percent higher than it currently sits. Apple's stock price is seemingly "tied to hardware," UBS analyst Steven Milunovich said in a research note provided to AppleInsider on Monday. As a result of the old thought pattern ignoring Apple's burgeoning Services revenue, "services probably [are] undervalued" by investors. "Management has emphasized the importance of services the past year," Milunovich said. "We consider the installed base and retention rate the primary drivers of device and services value. We also view Apple as a platform vendor with hardware and services intertwined. However, to test the notion that the market underappreciates services, we performed a sum-of-the-parts analysis. If Apple services were valued similarly to PayPal, the stock would be at least 10% higher." Apple announced that its Services arm generated $7.17 billion in revenue, beating the previous quarter's figure by 13 percent, as well as representing an 18-percent year-on-year growth. 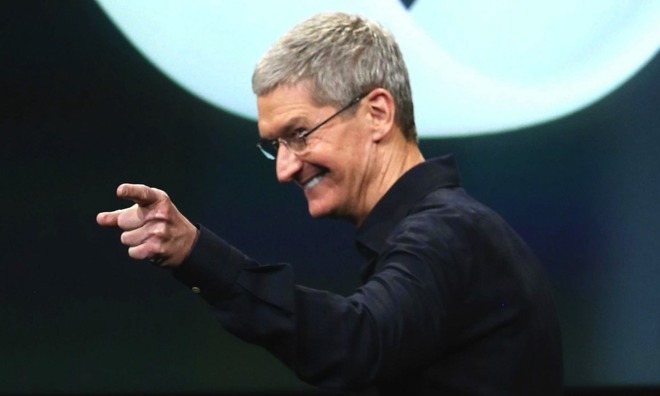 Apple CEO Tim Cook later stated during the conference call following the report that Services would likely be the size of a Fortune 100 company before the end of 2017. "Services' primary purpose is to act as the subsidizing side of the iOS innovation platform, creating the ecosystem that makes devices attractive," Milunovich reiterated in Monday's note. "In addition, services are transaction platforms in their own right, most notably the App Store, which accounts for most of revenue and profit growth." Investors responded to Milunovich's take on Monday, helping to send Apple stock up over 1 percent on the day. That has placed shares of the company above their old intra-day high, and could top the previous end-of-business record of $133.54 when markets close Monday afternoon. Researchers from other analysts also believe that Services will be the prime mover of Apple's profits going forward. Ben Schachter from Macquarie Research sees about 75 percent of total Apple gross profit through fiscal year 2021 coming from Services, including Apple's App Stores.